New for 2012 - We are thrilled to introduce two beautiful new pieces b y Sarah for 2012! 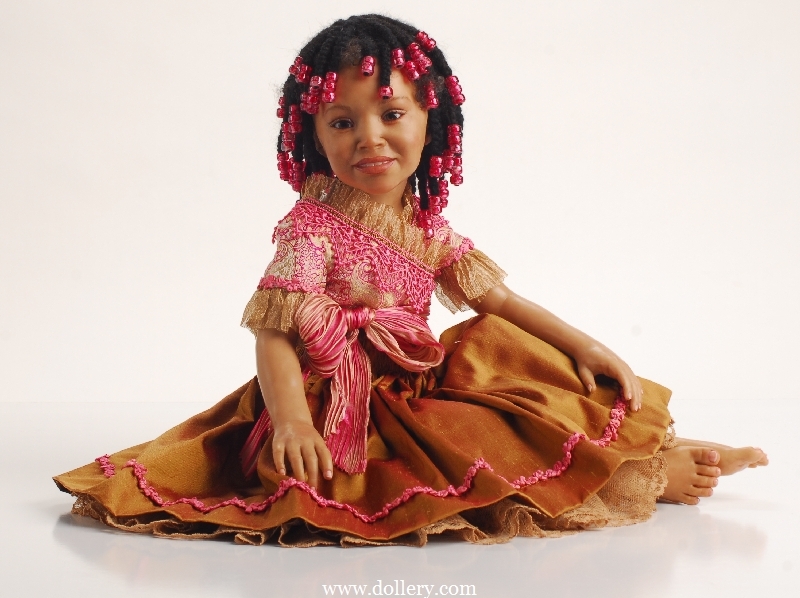 The little African American toddler is classic "Sarah" and she is so sweet - great price too - email kmalone@dollery.com. 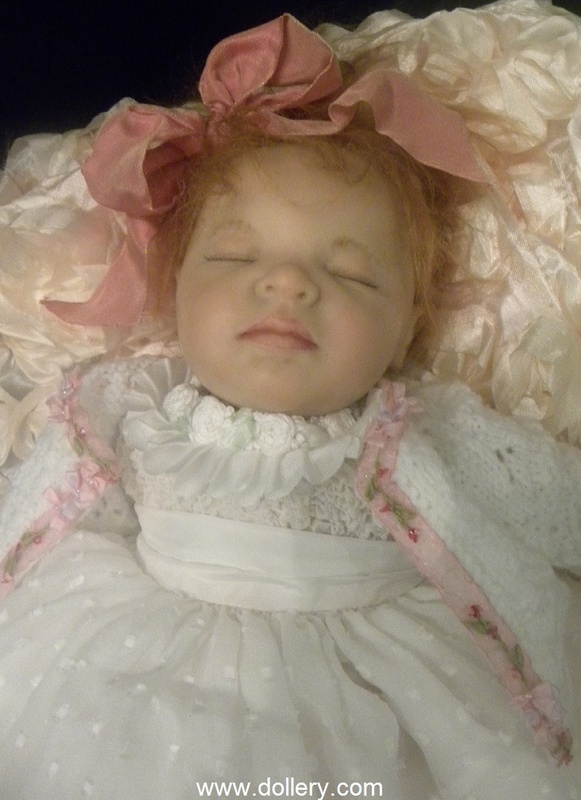 We couldn't resist this little Caucasian sleeping baby - she is adorable alone or as an addition to one of your larger collector's dolls! 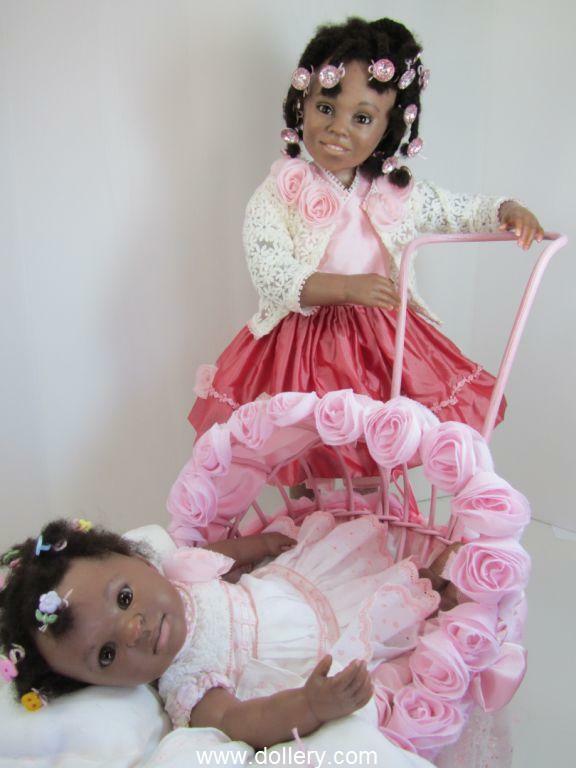 We have also posted on this page a beautiful new African American piece w/stroller and baby introduced at our most recent show and now on this page! ORNAMENTS - Sarah decided to offer some amazingly affordable baby ornaments this year in a wide assortment of looks! They are absolutely priceless! They range in price from $125.00 to $175.00. All faces hand sculpted by Sarah. She has continued to do a limited amount of them! This is an amazing opportunity to get a piece of Sarah's work at affordable prices! The pieces are approx. 5 inches in size. You can decorate a small tree for Easter or add an accessory to one of your dolls for valentines day! There are all kinds of styles available. The majority of the ones listed below are the actual pieces available; however, some are just samples of babies that can be done. You can also order for exp. a Caucasian or Af. American version of an ornament you have seen. Contact kmalone@dollery.com for more details! Shows: Sarah has participated in many of our shows including last year's show. 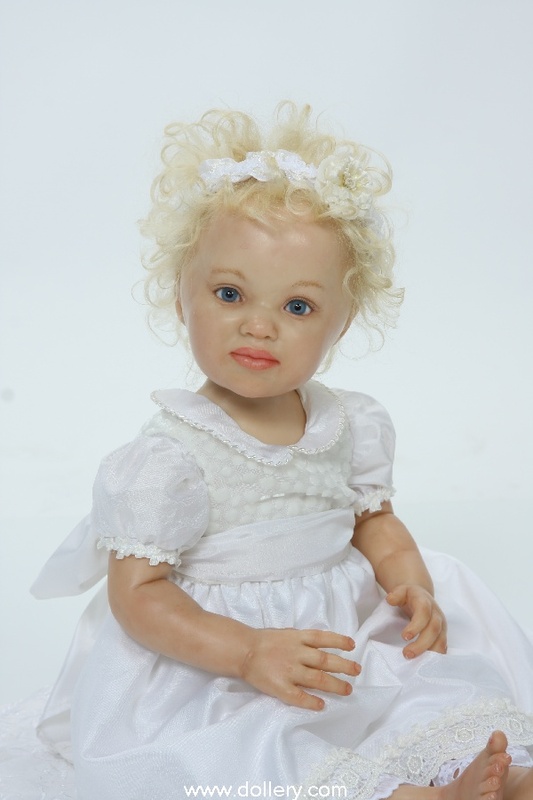 New work is also coming for our annual doll show in October 2012 as well. If you are interested in in pieces already previously sold be sure to contact kmalone@dollery.com for information on special ordering custom work. 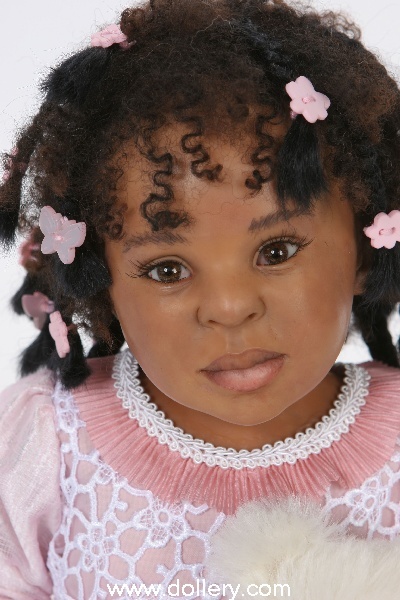 You may also call 800-447-Doll ext 15 and 781-447-6677 in state Ma. 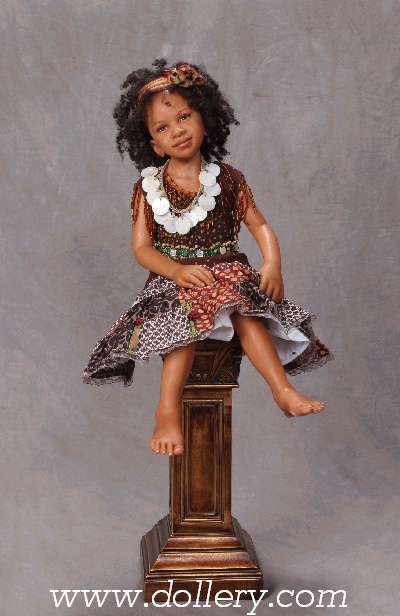 Note - Sarah's dolls in many prior years were full body one of a kind sculpts. Now, she does create the majority of her work with a combination of fabric and polymer clay to allow greater flexibility. Sarah's work is involved and very time consuming. The hands, feet and nails have amazing attention to detail not to mention her gorgeous realistic faces! 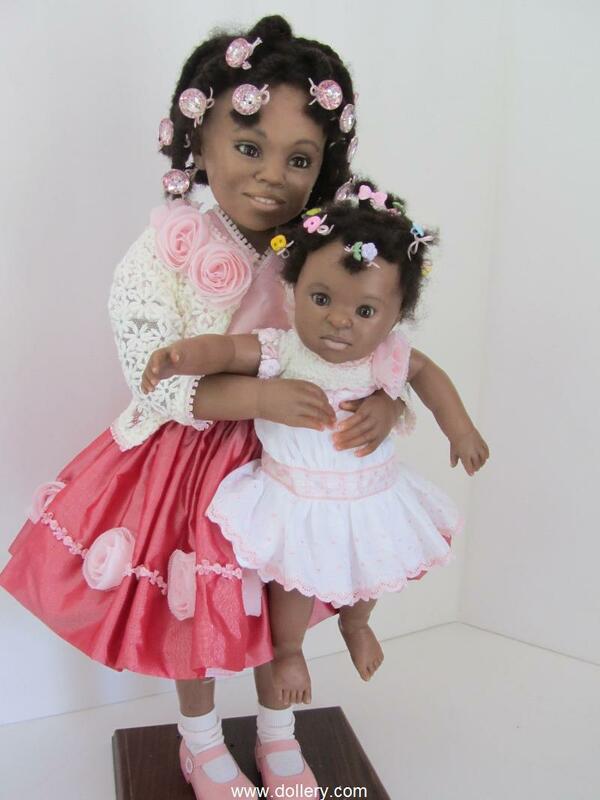 She creates less then 8 to 12 dolls a year...Don't miss them! Be sure to scroll down to see all of Sarah's work to see her range of talent. We were thrilled to have Sarah has attended our annual doll shows from 2002 thru 2009. This year she will also participate with all new work. Email kmalone@dollery.com to get on our mailing list for her work. in Sarah's schedule is booking up quickly. Be sure to email kmalone@dollery.com if you are interested in doing a custom order of any kind or want advance previews on new work by her. She sculpts with Cernit and applies washes of acrylics to enhance the clay. 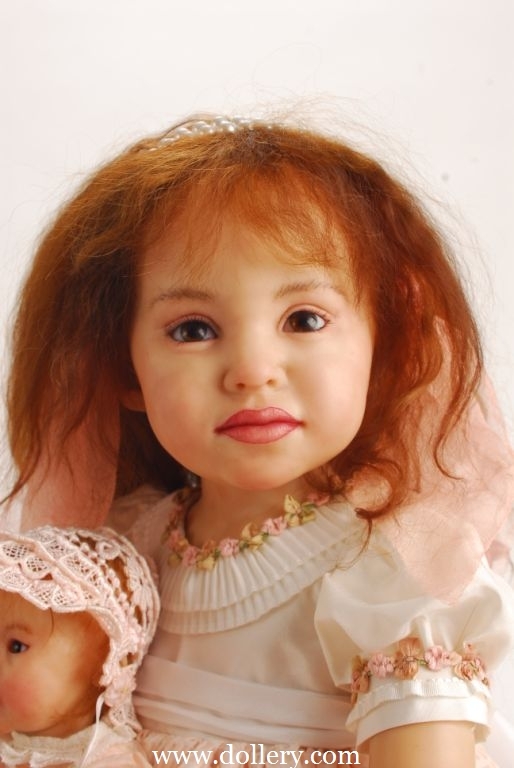 Her dolls bodies are constructed from various media and have a sturdy wire armature throughout. The fingers are all wired for extra strength. 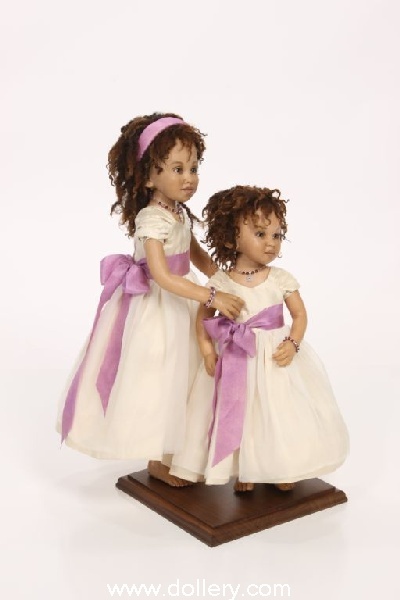 The dolls may have movable necks and can be gently posed in the desired position. She uses hand-blown glass eyes along with some that are custom made for her. 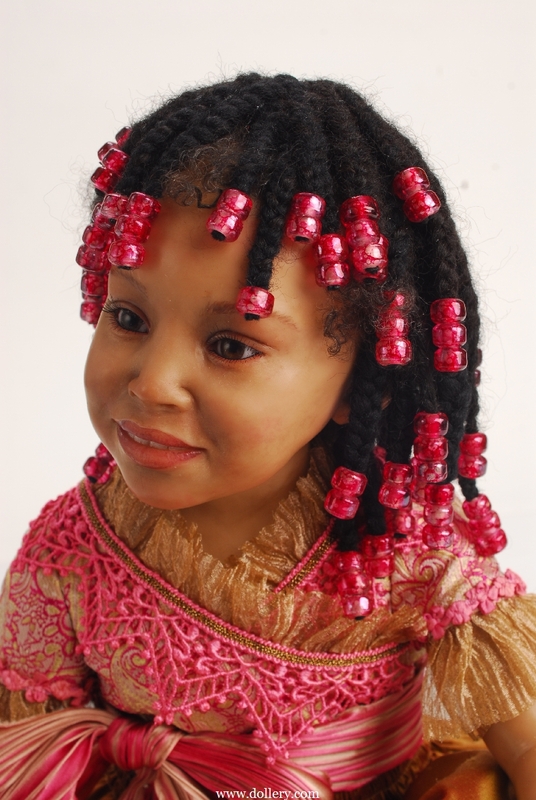 The mohair and fleece wigs on her dolls are all hand made by her. 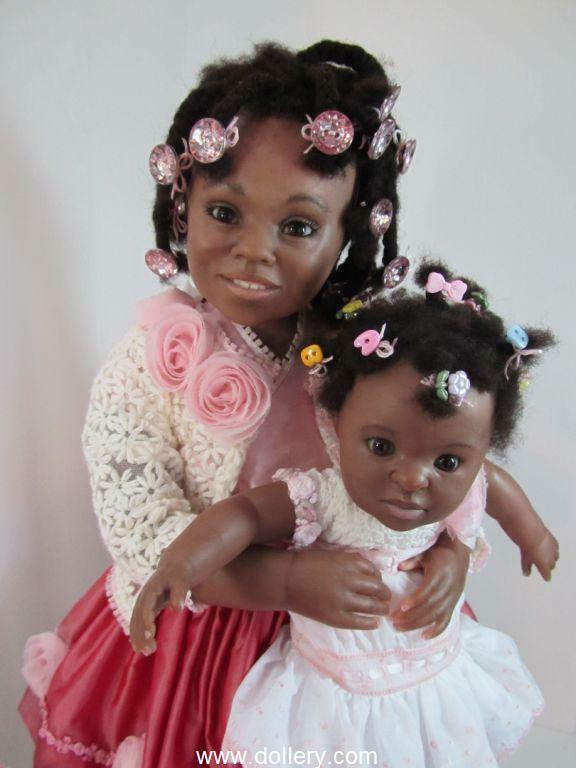 Her daughters help her with the braided wigs. 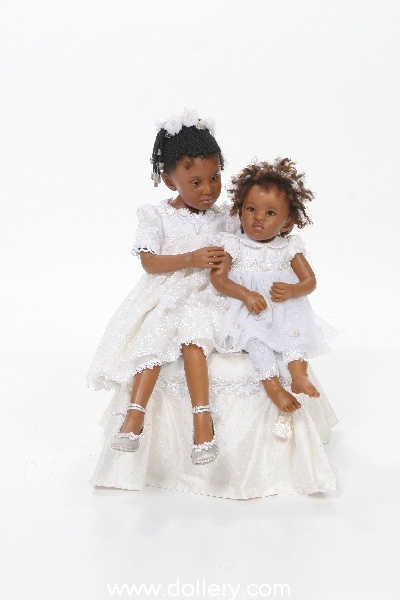 Sarah’s dolls range in sizes from 12” to 34”. She can work in any scale but prefers to work larger. 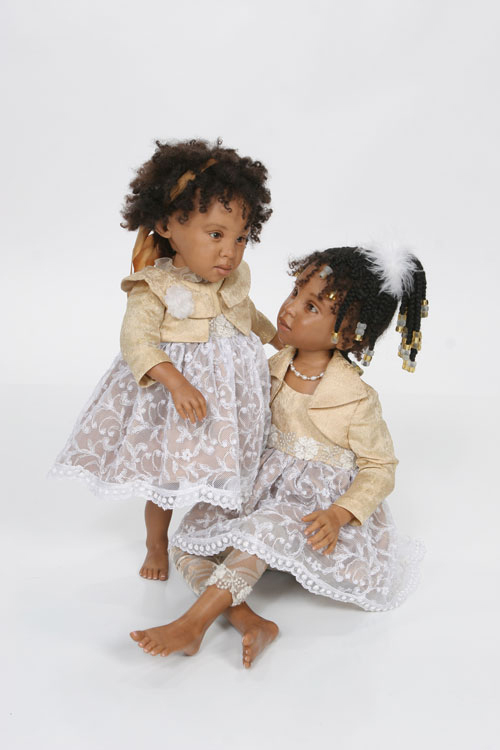 Sarah sews all of the doll’s clothing using the finest silks and cottons. Tatum - One of a kind by Sarah - Adorable! Very reasonably priced - email kmalone@dollery.com for details! 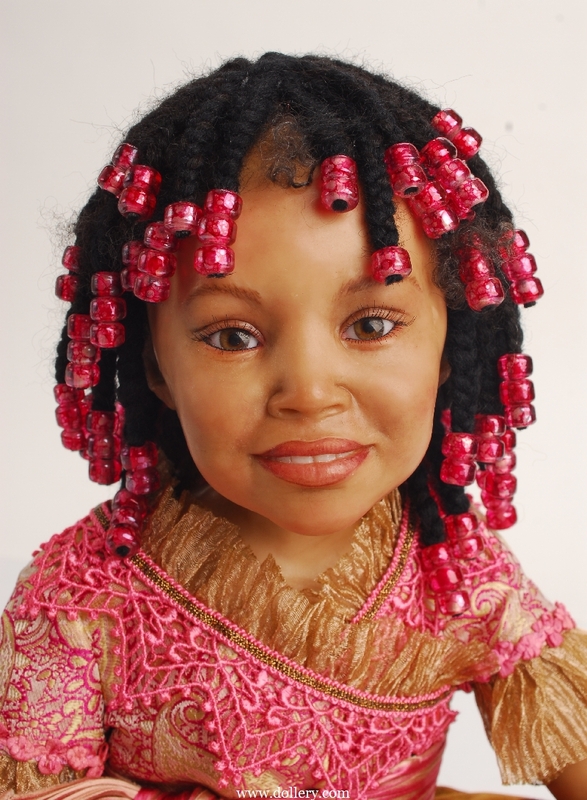 Sarah does the most incredible African American dolls. All the wigs are hand braided by Sarah! Sculpted of Cernit, she sits 12" (31cm). Hand-blown glass brown eyes. Sarah made and styled her wig from dark brown fleece. Her headband is made from silk and velvet flowers. Her clothing is sewn from fine white silks and trims. Sarah has done all the work on Tatum. 1/K, 16" (40cm), sculpted with Cernit. Strawberry blond mohair finished with a pretty pink bow. Here she is with her sweater off. Nora is sculpted to the upper arms and to the knees. Her arms and legs are slightly movable but are not meant to be posable. Her body is made using a variety of materials and has a sturdy wire armature throughout. Her head is posable. She wears pink silk velvet pants, a lace skirt and hand-knit sweater and lays on a fabric blanket. Sarah has done all this work herself. Her body is fabric and has a sturdy wire armature throughout. She is sculpted to her upper arms and to her knees. Her neck is posable and can be gently moved into the position desired. Her fingers are wired for extra strength. Would you like something similar? Contact Kim at kmalone@dollery.com to talk about special orders. One-of-a-Kind, Cernit Head, Arms to Elbows & Upper Legs, Painted w/Acrylic Paints, Moveable Head - Solid Body w/Wire Armature, Brown Hand Blown Glass Eyes - Hand Styled Wig From Dark Brown Fleece - 23” Standing, Comes w/Walnut Base. 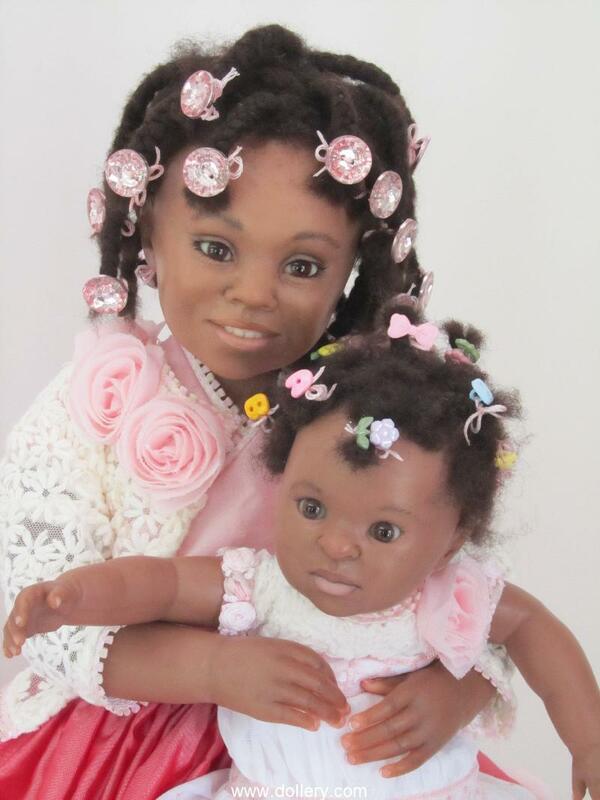 “Akilah” holds her baby, designed to be her dolly not her sister. 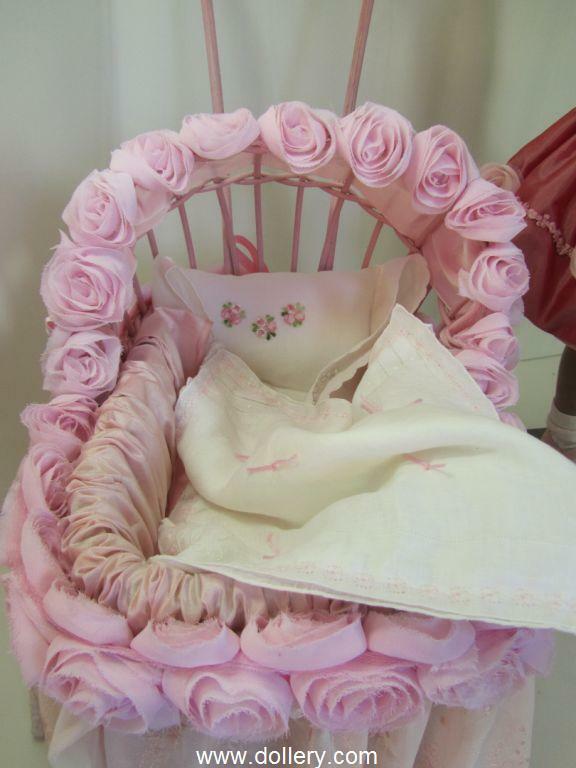 She comes with her pink stroller finished in silk, lace and vintage handkerchiefs. Her neck and arms are posable and moveable. Be gentle though! Her wig was custom made by Sarah and tied with buttons. 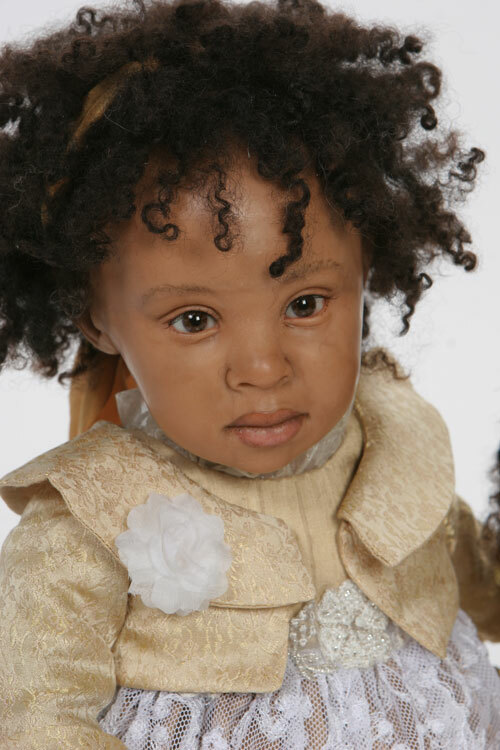 Some of the buttons on the baby say “baby.” Akilah’s non removable shoes are hand made by Sarah in pink leather. Her dress is sewn from pink silks and finished with a soft white sweater adorned with pink tulle roses. The same roses are on her skirt. 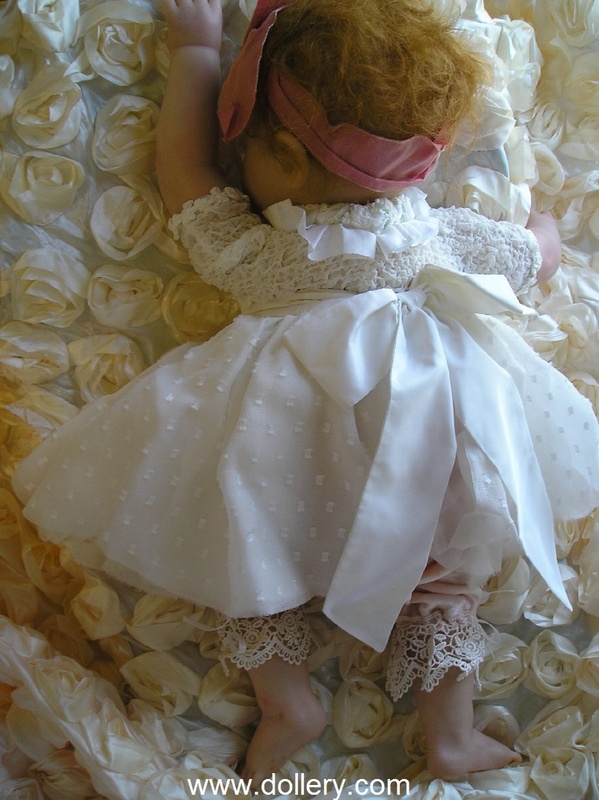 Her baby’s dress is sewn from soft white and pink eyelet laces and silks trimmed with pink silk and a tulle rose. Beautiful! 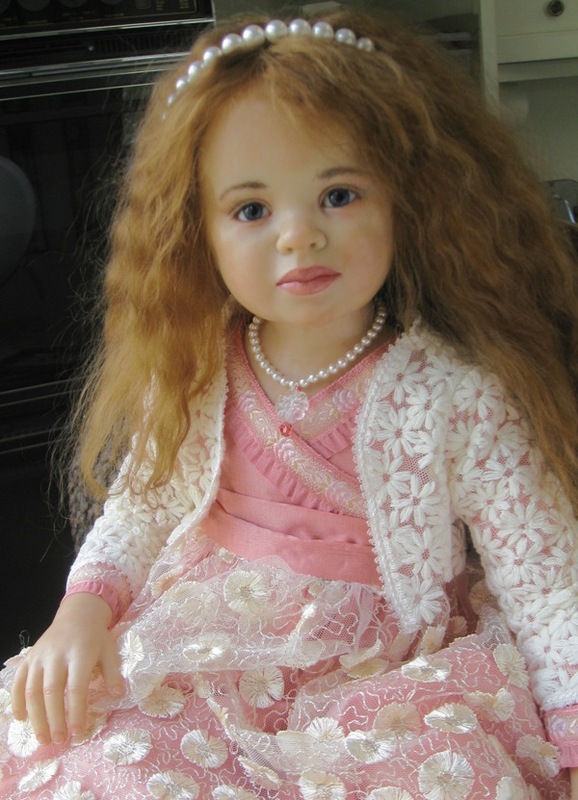 Here is another video about this doll! 2011 & 2012 ORNAMENT LINE FOR ALL SEASONS! These are actual pieces we bought and have available. There are many others to choose from but these were our favorites. 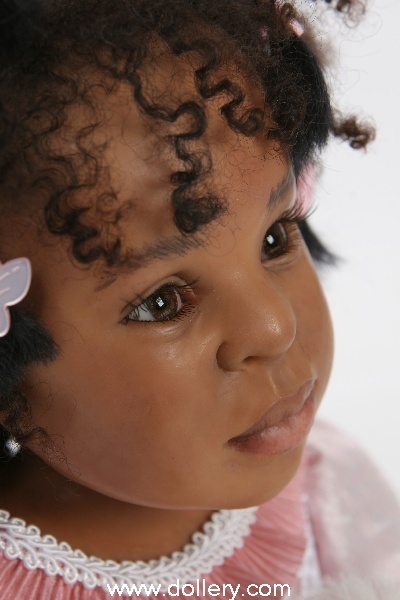 "Rock -a-bye-Baby" - $175.00 - 6"(15cm) Available in Caucasian or Hispanic as well! Adorable. Includes holder. Here is an idea of the scale of the pieces! They are a really nice size! 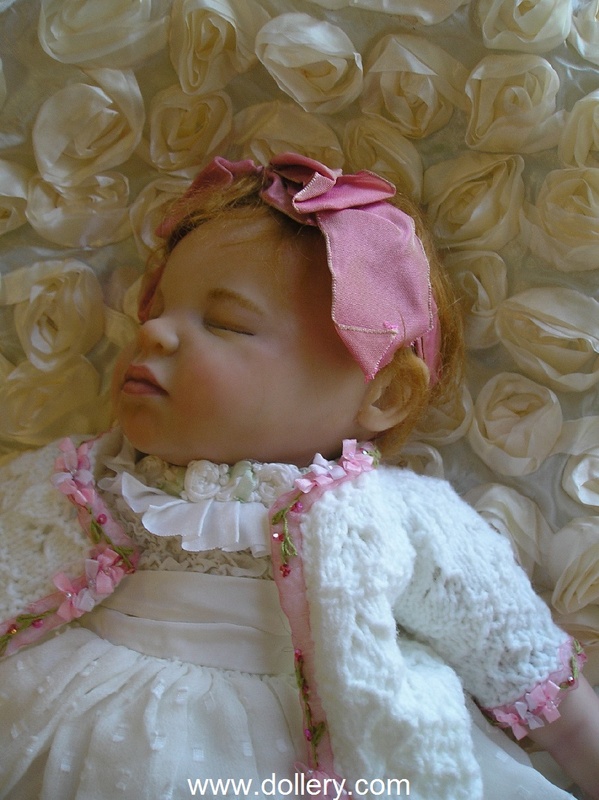 These OOAK collectible sleeping babies are individually hand-sculpted and embellished by Sarah Niemela. 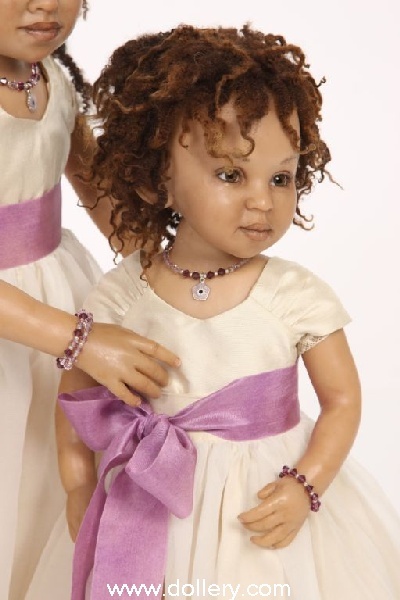 They make treasured keepsake gifts and will add some tiny sweetness to your doll collection! Each ornament is sculpted entirely from polymer clay; hand painted, covered with German glass glitter and other trims, copyrighted and signed by her. 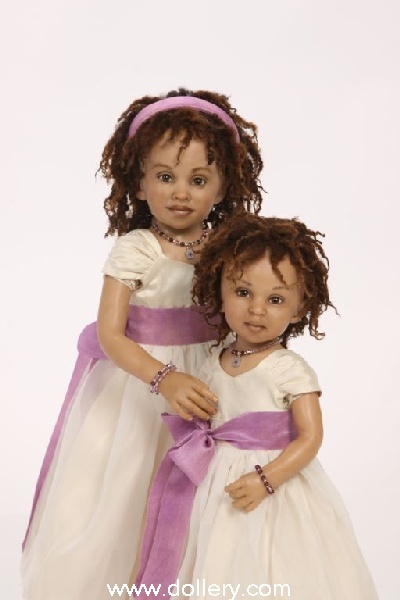 These dolls are covered with tiny glass pieces and not intended for play or for children to touch. Please handle them with a light touch and keep them out of direct sunlight. Start your collection today with this introductory offering. You won’t be able to have just one! 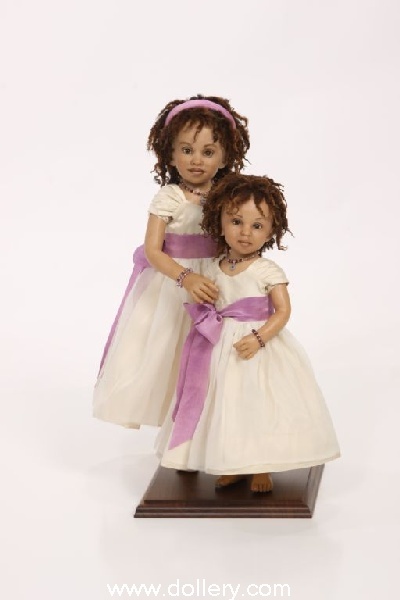 "The Twins" - $175.00 (Available in boy style as well and can also be special ordered personalized!) SAMPLE SOLD - but we an take custom orders for similar pieces. 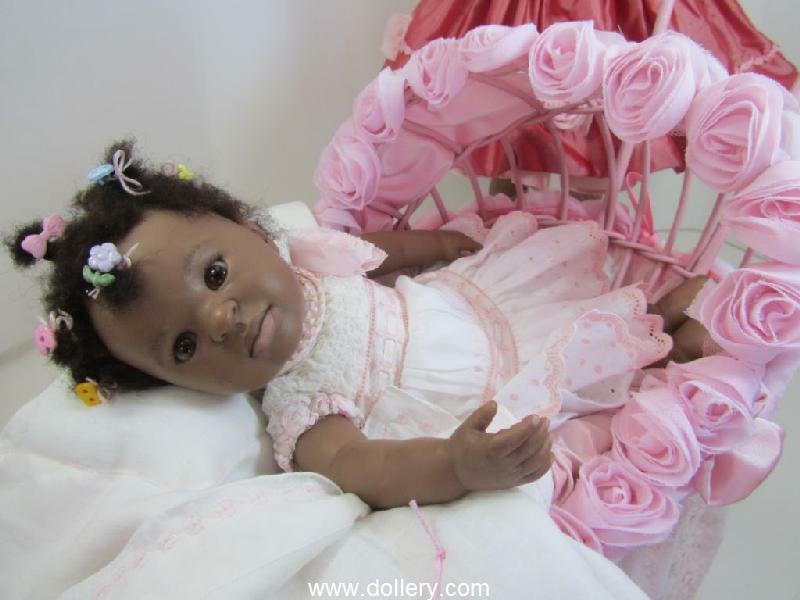 "Baby Meg" - $150, dorable! 5"(13cm) Available in African American as well or Asian! Can be personalize! This one is Sold but we can take orders for similar pieces. 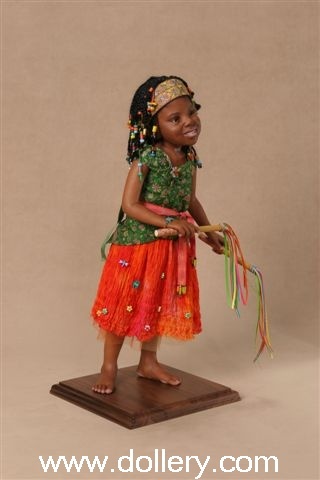 "Baby Noah" - $150.00 (Also in other ethnic choices) 4-3/4"(12cm) - SOLD - but we an take custom orders for similar pieces. 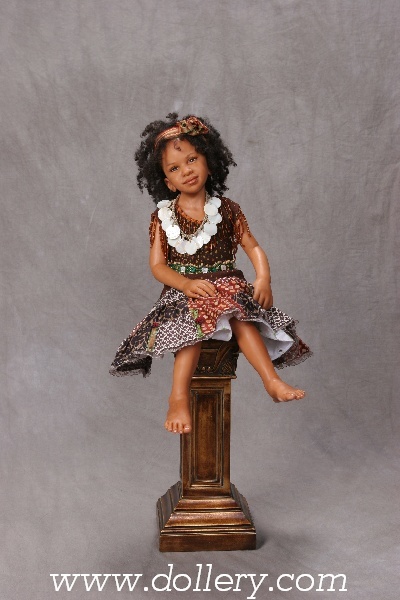 "Vivian" - $125.00 (Also in other ethnic choices) 5" (13cm) - SOLD - but we an take custom orders for similar pieces. Kenisha is sculpted from Cernit. The Cernit has been cured and painted softly with acrylic paints. Her body is fabric and has a sturdy wire armature throughout. She is sculpted to her upper arms and to her knees. Her neck is posable and can be gently moved into the position desired. Her fingers are wired for extra strength. Kenisha sits 12” tall. Her clothing is sewn from fine silks and trims. Her blouse is silk paisley trimmed with hand-dyed Venice lace and trims. Her skirt is bronze silk with a fine lace underskirt and tied with a silk Shibori ribbon. Kenisha’s brown eyes are hand-blown glass. I made and styled her wig from dark brown fleece. Her braids are finished with glass beads. Sarah has done all of the work on Kenisha. Mallory is sculpted from Cernit. The Cernit has been cured and painted softly with acrylic paints. Her body is fabric and has a sturdy wire armature throughout. She is sculpted to her upper arms and to her knees. Her neck is posable and can be gently moved into the position desired. Mallory’s arms are also slightly movable so you can insert and remove her baby doll. Her fingers are all wired for strength but please use care when moving her arms. Mallory sits 20” tall on a purchased chair. If she were standing she would be 23” tall. Mallory’s brown eyes are hand-blown glass. I made and styled her wig from auburn mohair. Her headband is made with ivory Swarovski pearls, little flowers and silk chiffon ribbons. Her clothing is sewn from fine silks and trims. 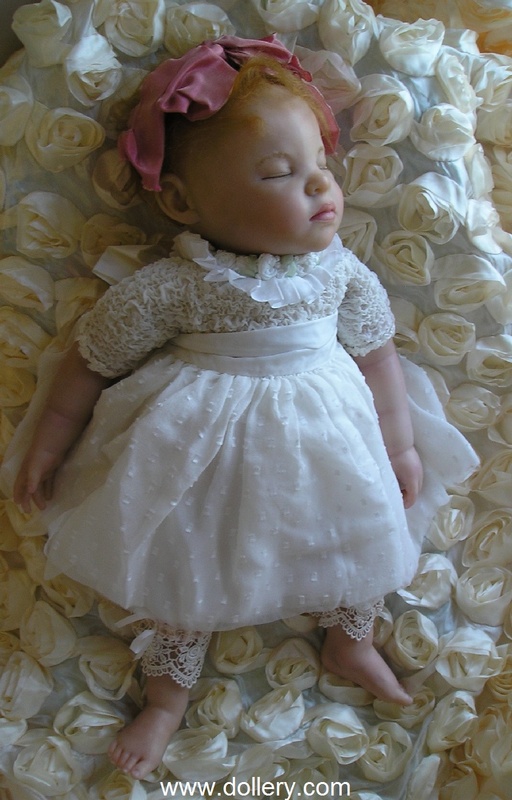 Sarah sculpted her baby doll and clothed her with a silk top, silk bloomers and a lace hat. 2nd headband available for Mallory below. Mallory comes with two headbands. The pearl headband is placed on by lifting her hair in the back and sliding it on with the pearls on top and the scarf holding it in place behind. The fabric headband slides from the top of the head. The base of it is metal and it will bend slightly in your hands to fit better. Be careful to avoid her ears when placing it on! 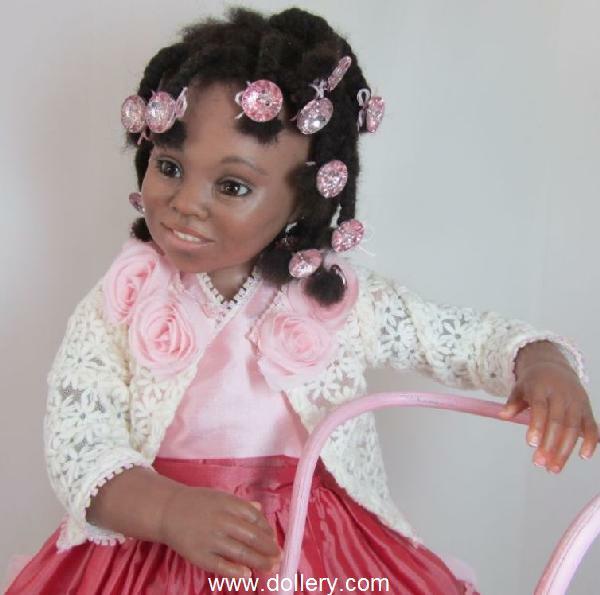 Little Princess - One of a Kind - Sold - Contact kmalone@dollery.com or call 781-447-6677 ext 22 for further details on custom orders for large dolls similar but not exact to any of the OOAK dolls shown here. 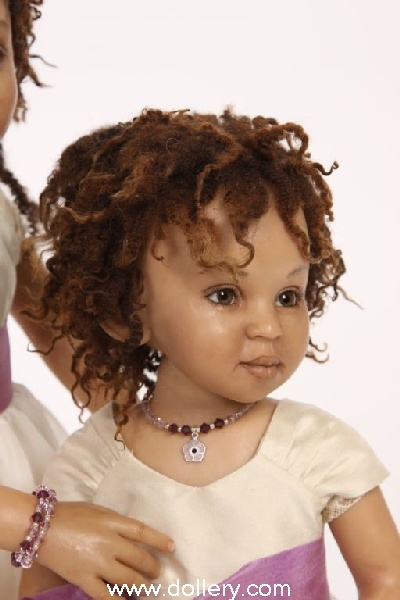 Sarah's dolls have fabric bodies with sturdy wire armature throughout. Jillian is sculpted to the knee and to the top of her arms. 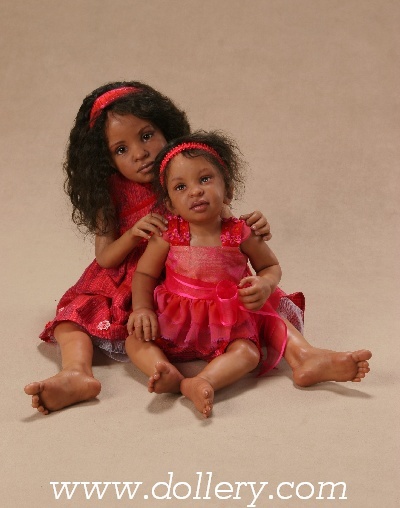 Danielle and Dana have fully sculpted legs and arms that are almost sculpted to the shoulder. Their arms really aren't meant to bend. All 3 dolls have moveable necks so they can be gently posed. One of a kind set, cernit painted with acrylic paints. Fabric body with armature. 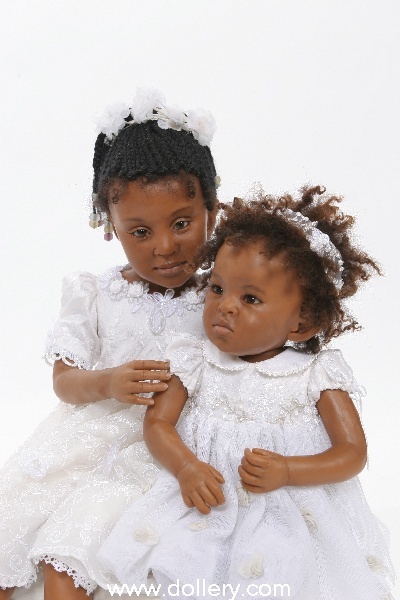 Danielle & Dana wear dresses made of fine ivory silk dupioni with silk chiffon overskirts. The dresses are hand tied with amethyst silk ribbon. They come complete with their handmade Swarovski and silver beaded jewelry. Cernit painted with acrylic paints, fabric body with armature, dark brown glass eyes, black mohair wigs. Jillian wears an outfit made of fine pink silk brocade and ruffled silk ribbon and rose adorned trim and a cherry blossom head piece adorned with butterfly pendants. 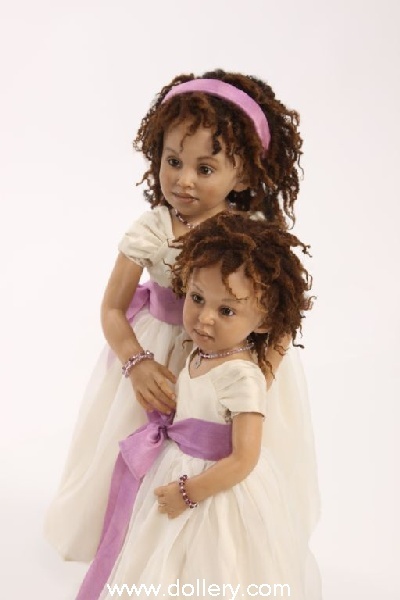 *Note - these dolls were individually priced but now sold as set. One of a kind set, cernit, painted with acrylic paints. Fabric body with armature. Melea is sculpted to the elbow and knee. Mercedees is sculpted to the upper arms and knees. Both have moveable necks so the can be gently posed in the desired position. Dark brown glass eyes, brown fleece wig hair. 19" & 21" seated. 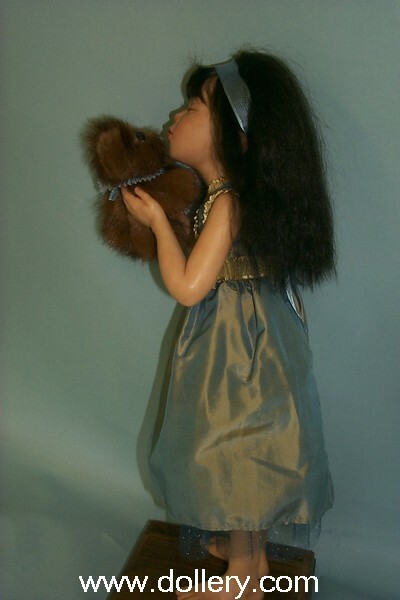 SOFIA, $2,800.00 SOLD - Call re: custom orders similar but not exact to her. 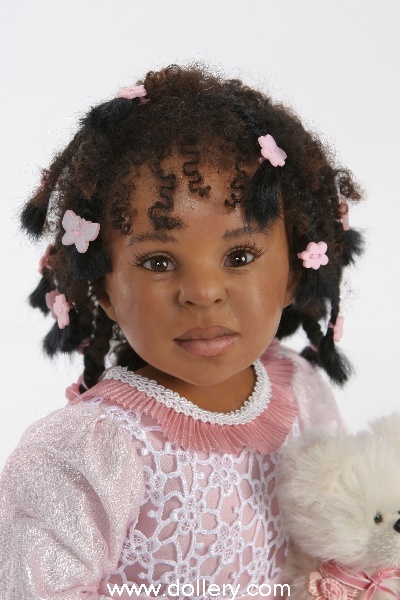 Sofia is a toddler sculpted with Cernit clay. The Cernit has been painted softly with acrylic paints. Her body is fabric and has sturdy wire armatures throughout. She is sculpted to her upper arms and knees. Her neck is posable and can be gently moved into the position desired. Sofia sits 14” tall on a round silk pillow. The pillow is 16” round. Sofia’s dress is sewn with fine white silk and trimmed with fine trims. She wears pantaloons sewn from silk. Her hand-blown glass eyes are light blue. 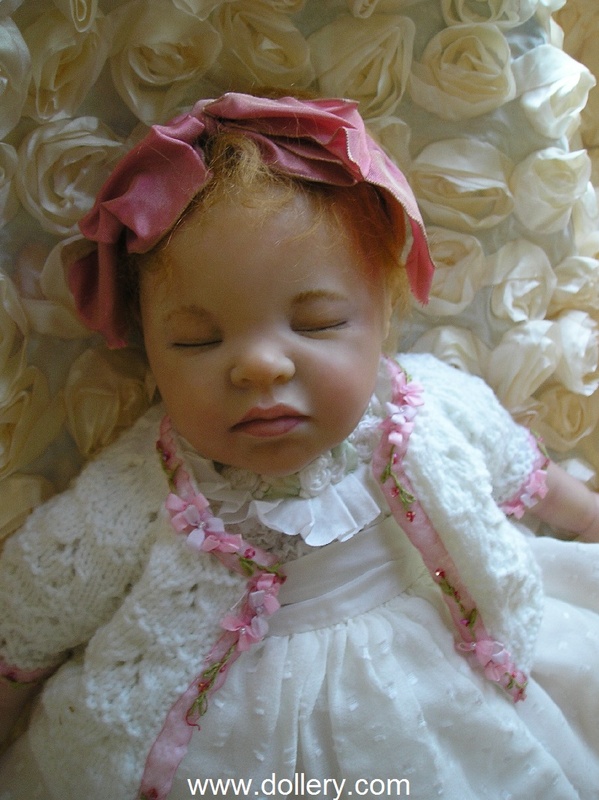 I made her wig with blonde mohair and tied it with ribbon and a vintage rose. I have done all of the work on Sofia with the exception of sewing her dress which was done by my friend. 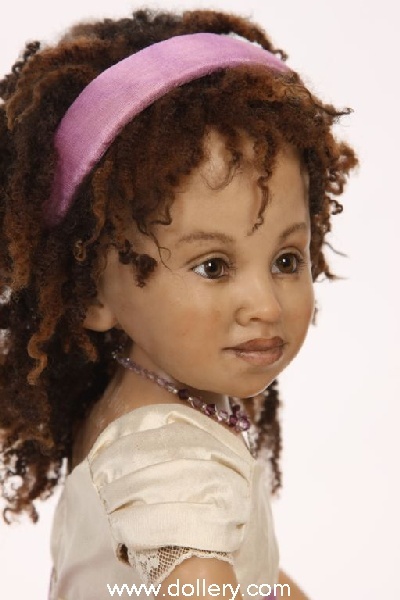 Sarah is shown here at our 2006 Doll Show - She also personally attended our 2007 doll show. 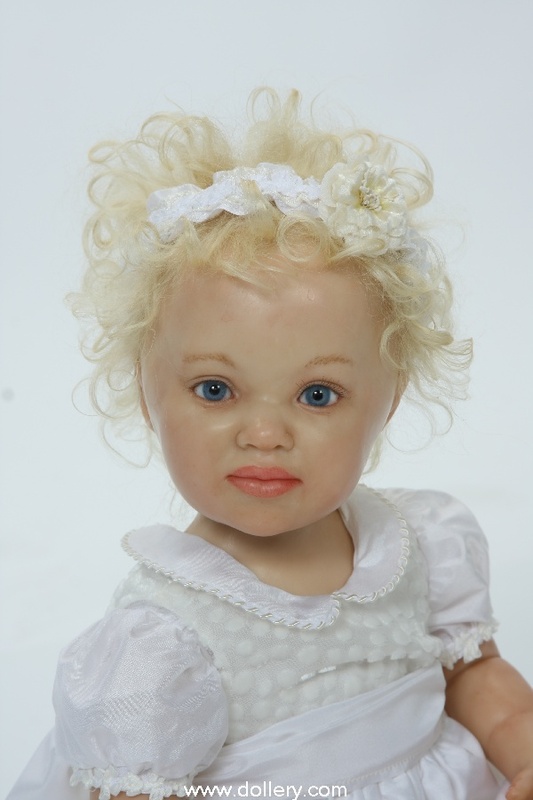 on ordering similar dolls to Eloise or notification on new toddler babies that come in by her. 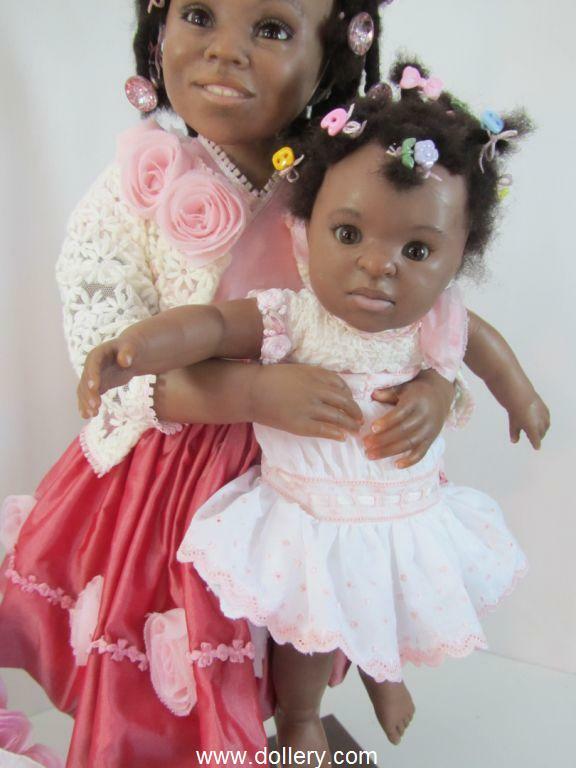 on custom orders for African American sets and or individual dolls custom done by Sarah. Sitting on a white silk covered hat box. The whole piece measures 14 inches wide by 18 inches tall by 14 inches deep. Sierra is sculpted from Cernit with a fabric body. If she were standing she would be 21 inches tall. Braided mohair wig. Each braid is adorned with butterfly and flower buttons. Sierra’s dark brown eyes are custom blown-glass. Her dress is sewn from fine pink silks and white silk lace. Her shoes are made from pink silk and decked out with flowers and silk trim. One of a kind set of mixed media. Janeka is 22" and Jessica is 16". They both have dark brown glass eyes and dark brown mohair. 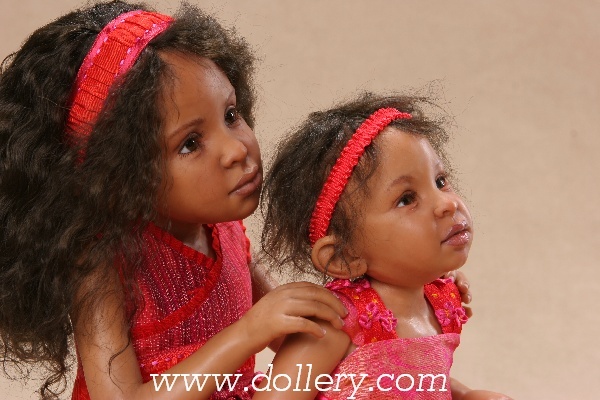 Both dolls are full-body sculpts in mixed media. The baby has a spring mechanism in her arm. Janeka, the older sister, has partly sculpted arms designed especially for her that have some movement. The arms are not posable and they are meant to be stationary. Janeka and her baby sister are enjoying time together sitting on a white silk ottoman. The whole piece measures 10" wide by 20" tall by 8" deep. Janeka's braids are adorned with glass Czech beads. Her ponytail is tied with white silk flowers. Jessica's mohair wig is tied with a silver lace ribbon. Their brown eyes are both made of custom blown-glass. Janeka's dress is fine white silk with silver trim. Her shoes are made from silver silk with flowers and silk trim. Jessica's dress is white silk and her skirt has tiny silk flowers sewn on. The set comes complete with stool. $2,700, One of a Kind, Polymer clay, moveable arms with attached springs in bodice. Closed eyes, black mohair, 19 1/2" on walnut base. 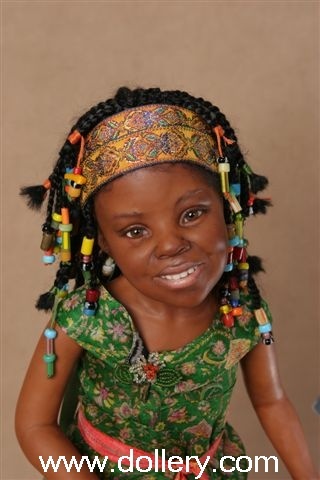 Kia's body was made from a body mold designed by Sarah. She has been redressed by Sarah and now wears a blue and gold iridescent dress with gold silk trim. Her hair is tied with a blue ribbon. We just love the little bear Sarah gave Kia to kiss! He is as soft as mink! One of a Kind, 18", dark blue glass eyes, auburn mohair. Cassidy's clothing is sewn from mauve silk with silk trimmings. 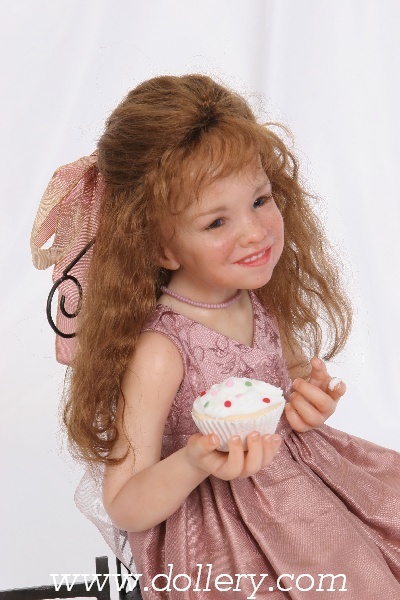 She is holding a cupcake that is sculpted from clay. Her artist bears sit at her feet. One of a Kind, 20", Dark brown eyes, Dark Brown Mohair. 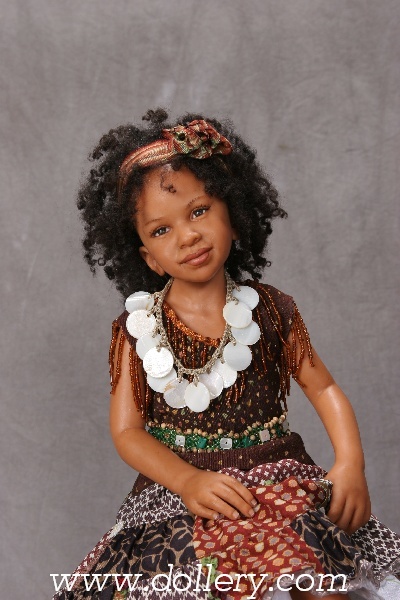 Jasmyn's wig is braided into about 70 braids each adorned with authentic African glass beads. Her clothing is sewn from vintage fabrics and adorned with a vintage glass pin. She is holding wands with ribbon streamers. Simone is wearing clothing made from vintage fabrics embellished with fine trims. 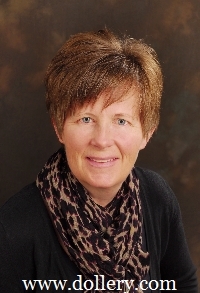 She wears beads on her blouse, around her neck and on her belt. She sits on a bronze painted pedestal. 447-6677 in Ma to order and for layaway options. Please email kmalone@dollery.com if interested in ordering a similar look. Dark Brown Glass Eyes, Dark Brown Mohair, 12"
Leslie's dress is sewn from red striped silk and adorned with silk embroidered flowers and ribbon. Leya's top and bloomer are sewn from red and pink silks and tied with a pink silk ribbon. All done by Sarah herself!